We just finished our first Keipi Journey. This one was to Guatemala. We were a small group, no more than six at any time. Our field workers led supporters in a unique tour of mountainous Guatemala. We visited Momostenango and broke bread with numerous impresarios. Impresarios are local folks with dreams for a better future. 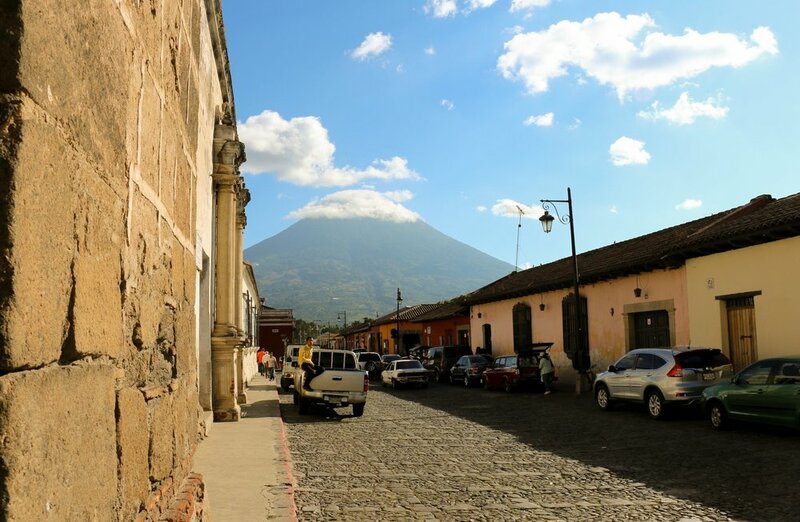 Antigua, our first stop on the Guatemalan Keipi Journey. Impresarios are people like Abraham, a principal of a local school for underprivileged kids. His school is free. He works and teaches for free. His work is simple and humble and given out of love. His family pitches in to make his tiny school work. They admire their patriarch. We do too, and in turn we've begun our partnership, invited him to our white board session and spent time working on a sustainable plan for the long term health of his school. The first step together is to rebuild the school roof. Up until now, the kids get wet as they learn to write. The roof is sponsored by an FTF investor. Her name is Stef. She is a member of our FTF Hub. She was also on our Keipi Journey. She broke bread with Abraham and shared toasts and music at his table. It was a beautiful night. Our Keipi Journey also included a Georgian style dinner in a place called Antigua. This dinner saw 10 of us toast to the great themes of life. We spent an incredible evening chatting about love and fear and culture and doing it all with a mix of Americans, Guatemalans, Canadians and a most interesting Greek American with a sultry baritone singing voice. Yes, we sang! And in it all a certain beauty was revealed, a centerpiece of sorts, a beauty that resembled the end of time, the end of things temporal and a testimony in words to what it means to be truly human. And time and again on the trip we returned to these themes. Whether surrounded by street kids and the stench of poverty or the splendor of a lakeside resort, we returned to these themes. We couldn't help it. And in fact we didn't want to "help it”. It was if we were meant for these conversations. By the end we all agreed that we were! We wondered aloud why these rich conversations elude us in our other lives, our "real" lives. And for most of us the trip kept arranging a reckoning. In the end the trip kept pointing us toward a simple truth: There is no other life, a “real” life. There is only the one life, the one journey, and we are sojourners on that journey, every minute, every second. We realized that what we talked about here we lived deeply back home-- even when we don't talk about it. This trip, like a velvet vice, squeezed the humanity out of us, squeezed the hard words and the vulnerability out of us. It was a good journey indeed Consider joining us in Cuba, Guatemala, West Africa or Georgia... or all of these places!